'Abdu'l-Bahá's Journey in the West . . .: July 17, 1912 Turning the "water of life" into "wine"
July 17, 1912 Turning the "water of life" into "wine"
Mahmud writes: "`Abdu'l-Bahá returned to New York to find a large group gathered at His home, waiting for Him. At the meeting the Master shone as a lamp and burnt away the veils of superstition. One eminent woman, a doctor, asked him: `What is the cause of all these calamities and troubles in the world of creation?' He replied: Calamities are of two kinds. One kind results from bad morals and misconduct such as falsehood, dishonesty, treachery, cruelty and the like. Surely, misdeeds bring forth evil consequences. The other kind is the result of the exigencies of the contingent world, of consummate divine law, and of universal relationships, and is that which is bound to happen, as, for instance, changes, alterations, life and death. It is impossible that a tree should not wither or that life should not end in death. Answering questions from the audience, `Abdu'l-Bahá explained that God is holy beyond comprehension, appearance, ascent and descent, ingress and egress, thereby correcting the erroneous notions of some philosophers and ascetics. The Master's explanations were long and very convincing. A wonderful meeting was held in the evening. Two very dear friends, Mr Harlan Ober and Miss Grace Robarts were married. Besides the many friends, many others were present, including a very devoted Christian minister [Howard Colby Ives]. The Master had instructed that the wedding be performed according to the law of Christianity and it was performed by the minister. After the ceremony, `Abdu'l-Bahá rose and chanted a prayer, blessing the marriage of the two devoted believers. Congratulations were given and everyone praised the ceremony." "There are several accounts of this wedding. In her obituary of Grace Ober, Mabel Rice-Wray Ives writes: During the months of `Abdu'l-Bahá's stay in America in 1912 Mrs Ober (Grace Robarts) had the honor of being indeed the `servant' in His home in whatever city He was staying. He chose her to go ahead and secure an apartment for Him and have it in readiness upon His arrival. Then she would care for His home as a housekeeper and hostess while He and His secretaries and those Persians who had the privilege of serving Him in various capacities, remained there. She kept the home immaculate, and always ready for the constant stream of guests from morning to night, Bahá'ís and inquirers and souls in difficulty to whom `Abdu'l-Bahá was always a loving Father. It was during one of the New York City visits of `Abdu'l-Bahá that He suggested her marriage to Harlan Ober. Gaining the consent of these two devoted believers, who in His consummate wisdom He had drawn together, He, on the following day, July 17, 1912, married them in the morning according to the Bahá'í marriage. This infinite bounty of being chosen for each other and joined in marriage by the Centre of the Covenant Himself was a unique favor bestowed upon these two souls alone, out of all America.The Bahá'í World, vol. 8, p. 658. "In the evening I returned from a wedding, Grace Robarts' and Harlan Ober's, where the Master, for me, as well as for the bride and bridegroom, turned the water of life into wine. Grace and Harlan stood together, transfigured; they seemed to be bathed in white light. Mr Ives, standing opposite, married them. Back in the shadow sat the Master. There were times when I, sitting at a little distance from Him, felt His lightning glance on me. At the end of the service He blessed the marriage. Diary of Juliet Thompson, pp. 350–51. After the simple wedding ceremony and the bride and groom had resumed their seats, `Abdu'l-Bahá rose. His cream-colored `abá fell in graceful folds to His feet. Upon His head he wore a tarboosh, or fez, of the same color, beneath which His long white hair fell almost to His shoulders. Most impressive of all His impressive aspects were His eyes. Blue they were but so changing with His mood! Now gentle and appealing, now holding a deep, tranquil lambent repose as though gazing upon scenes of glory far removed. His brow above those wide-set eyes was like an ivory dome. His neatly clipped beard, snowy white, touched His breast, but around His mouth no straggling hairs obscured the mobile lips. He spoke through an interpreter, as was His custom . . . He swept the room with a glance at once enfolding and abstracted. He raised His hands, palm upwards, level with His waist, His eyes closed and He chanted a prayer for the souls united by Him and by me. For another account of the wedding see Star of the West, vol. 3, no. 12, pp. 14-15." ". . . It was not long after this that Lua came to Grace and told her that it was the wish of Abdu'l-Baha that she marry Harlan Ober. Grace was shocked. 'Why I don't really know that man! I've only met him a few times and that very casually. Besides--I'm almost engaged to someone else. He's asked me and I'm I'm making up my mind. How could I think of marrying Harlan Ober?' Lua smiled, "I'm only repeating Abdu'l-Baha's request," she said gently. So Grace quickly put the idea out of her mind. The next morning Lua came the second time to deliver the same message. Again Grace dismissed it all as being utterly fantastic. The third morning when Lua came she added her own remarks to the message. "You'd better really consider this, Grace Abdu'l-Baha does not make suggestions lightly." Grace, this time, realized how serious this was. 'But what does He want me to do? Write to Harlan Ober, whom I scarcely know--and propose to him? How could I? Oh, Lua I do want to be obedient but how on earth can I? Lua hugged her and patted her consolingly. "I'll do it," she said. "I know Harlan very well--it was through me he came into the Faith. I can do this easily." So Lua wrote to Harlan--and Harlan, radiant at the thought that he was obeying a suggestion of his beloved Master, took the next train to New York from Boston where he lived. He came at once to see Grace and together they went walking through Central Park where he proposed and Grace, still. dazed.and uncertain, accepted--because it was the will of Abdu'l-Baha. The next morning they were called into Abdu'l-Baha's bedroom. And. 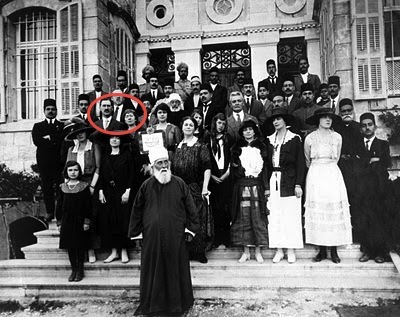 Abdu'l-Baha was there, with one or two others, waiting to perform the marriage ceremony. Grace remembered, afterward, entering the room. She remembered the look of warm love on Abdu'l-Baha's face; she remembered the bands of sunlight on the floor and the bowls of roses on the tables and the next thing she was aware of was lying on a couch with Harlan bending above her asking if she felt better. She then discovered that the marriage had been performed--a marriage that, with no faltering, she had gone through with Harlan at her side then, when it was over, she had swayed a little and they had suggested she lie down. Abdu'l-Baha, smiling and serene, was watching her with great love knowing perfectly well how overcome with the spiritual force of these great moments she had been and knowing that the whole experience only proved her great spiritual susceptibility and capacity. So were Grace Robarts and Harlan Ober married by Abdu'l-Baha. Later that same day they were married again by the laws of New York when Howard Colby Ives performed the legal ceremony. This was told to me by Grace Ober at Green Acre c. 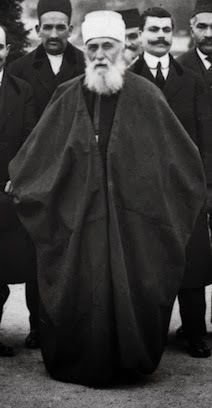 1933." I never thought of Grace before as servant of the Servant of Baha. She must have been closely connected to the Master.